Has someone cured the common cold with a Raspberry Pi? No. They haven’t. What’s taking you all so long? I felt it coming on last night. That heavy-headedness. The slight tickle in my throat. Blurry vision, sudden chills, a desperate need for snuggles. Colds can go from zero to a hundred within minutes, and then, no matter how much you hydrate, how early a night you get, or how much medication you take, you know you’re going to wake up feeling rough. As I have done today. And nothing came up. Nothing at all. I mean, I know you’re all busy living your best lives and all that, but c’mon, team — I was counting on at least one of you to have fixed this by now! You’ve let me down, but I am going to give you all another chance to make amends. In the comments below, or in reply to the social media posts on Facebook and Twitter about the publication of this blog post, I’d like you to invent a Raspberry Pi project that will aid me in getting over my cold. It may be a robot that hands me a tissue, or one that rocks me to sleep. It could be an algorithm for predicting when I’ll next get sick based on certain factors such as climate, schedule, or my poor, vitamin-deprived diet. It could even be a drone that will deliver my mother to my house whenever I need attention and a hug. And no, you don’t have to actually make the thing. Just tell me what it would do and, if you like, include pictures! I’m going to make another cup of tea and curl up on the sofa with She-Ra on Netflix. Ta! While true, I’d like to not be injured in the process of getting better. Haha. What if you used the owi robotic arm attached to the raspberry pi with the USB add-on thing and make it take a tissue out of a box at the push of a button or maybe with voice control and hand it to you (maybe have the contraption attached to the side of your bed?). 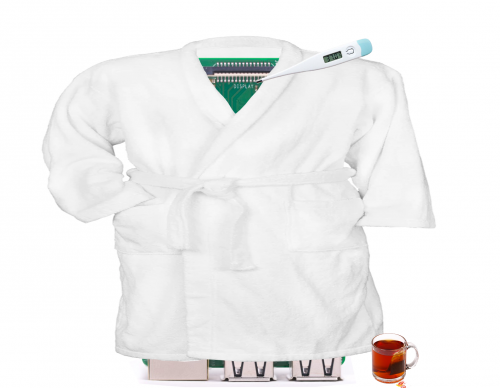 How about a Raspberry Pi “Hot Toddy Maker”? A device to mix the correct doses of honey, lemon and brandy (or Scotch Whisky as appropriate), heat it to the correct temperature before dispensing. As a special bonus, it could be configured to exceed the correct doses for some, or all, of the ingredients. How about you wear a tag and theh a drone, controled by a pi, flys to you every N hours with some water and what ever pills (like vitamin C and echinacea) you need to take at the scheduled time. Apparently vitamin-wise the ine to take is D. Yes that’s right, not C but D. I read that in the BBC website, I think. Well, it was a good enough source for me to start taking it daily. Apparently in winter we should all be taking it due to lack of sunlight – sunlight lets our bodies make vitamin D you see. That’s not the real She-Ra. She’s an imposter! How about use the LTE hat and make a push button for doctors calls. Maybe some sort of mic recording of what your issues are and give the doc another pi to receive and have it so the docs pi interfaces with the docs network and automatically schedules your visit. A couple of picams around the house, opencv model looking for smiles, gait, and general zest of movement (“train” with a self-reporting diary). Hook it up to your WristBit pedometer/heart rate monitor, and perhaps a diet diary, and build an AIflow model to run on Intel’s current or Google’s imminent USB TPU. I don’t know how to do any of this, but if you do, I’d quite like a download of a cold and mood predictor image file. Common cold is caused by a virus. It doesn´t matter how much vitamins you take or any other factor, the best defense would be to avoid getting in contact with the virus. Yes, I know you said “cure”, but why focus on the cure when you can prevent? Here´s where the Raspberry Pi can come handy. Have a Raspberry Pi attached to your clothes (or hat, or helmet) together with some mcirophones and a camera, a couple of motors and a face mask. During normal times the face mask will be ketp away from mouth and nose. When the Raspberry Pi, using Computer Vision and/or audio analysys, detects someone sneezing (or even better, it detects that someone is about to sneeze) it moves the face mask into position, effectively preventing the infection. Then there should be a second Raspberry Pi (together with a camera, bacterial gel dispenser with some kind of pump) monitoring your hands. As soon as the system detects that your are going to get in touch with some object it should activate the pump to dispense the appropriate amount of gel to clean said object. How come no one has thought of something like this before? Not cold related, but mold related, are there any devices that detect mold spores? Who is “She-Ra”? Is she related to “He-Man”? I hope, auto shutdown included in your plan? And this device should play soothing music or soft noises (rain, sea or forest – whatever pleases you) in addition. Hygienic measures such as handwashing can prevent the spread of respiratory viruses, especially from younger children. Reccomend creating a Raspberry Pi assisted handwashing scanner. Hands will be washed using an anti-bacterial soap with a pigment that illuminates in black light. The Raspberry Pi assisted hand scanner will set outside the bathroom. It will measure the amount of area in the image that is filled with remnants of the black light pigment. When > 90% of the pigment has been removed, then the device will announce a positive ring, else, it will announce a short failure tone. The device could also be programmed to dispense a sticker as a reward for practicing good hand hygiene. That would actually be quite interesting. is the rasperry pi not booting? You can just run it and let it be hot, so that you could feel worm and nice.